I've been battling what may or may not be whitespot for the past few weeks, and it has cost me dozens of fish. Now, I'm left with three gobies that I thought were immune (they remained uninfected while the other fishes were dying left and right), but the white spots appeared on them a couple days after the other fishes had died (maybe meaning that the contagion is water-bourne and floats around in the water column, in which case a UV steriliser might come in handy). I originally thought the white spots were just parasitic mussel larvae, but I treated the tank with raised temperatures in case it was whitespot. The high temps didn't seem to do anything except stress out the fishes, which ended up dying anyways. Curiously, the two tanks that the white spots both use the same substrate (collected river sand)? So is it whitespot that I'm fighting or something else? Sorry for the poor picture quality but it shows what I've been dealing with. It's most prevalent on the pectoral fins, there's only a couple spots on the rest of the body, and a bit on the eyes. Last edited by pseudechisbutleri; 07-11-18 at 08:19 PM. It looks to be whitespot - generally you will get whitespot into your aquarium at some point, however typically a healthy fish should be able to survive. Are there any other factors that could be affecting their stress or health? 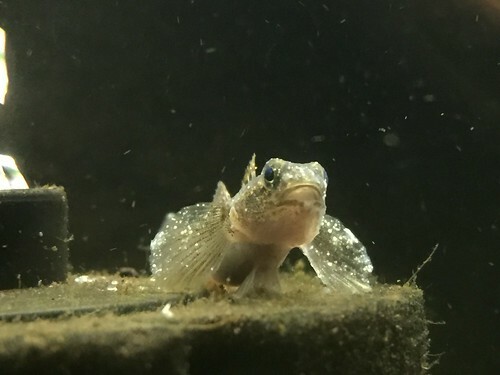 The gobies not getting it at first is probably due to them being less stressed initially and then they are either overcome by the parasite load or water parameters have shifted to be less in their favour. I haven't changed anything in the tank prior to them contracting whitespot, in fact the parameters should be better with a smaller bioload, and I did a 50% water change a few days ago. If you haven't seen this fellow, he gives good advice about disease. Get yourself some meds and follow the instructions. If you do not follow the instructions properly you will fail to eradicate it. Increasing the temp merely speeds up the life cycle of the whitespot. It just make it a little easier to treat but has obvious cons as well. Ich (Ichythophthirius) or Whitespot is a parasitic protozoan that infects fresh, brackish and saltwater fishes. It is identified by small white spots that appear on the fish's body & fins. The goby in the picture appears to have whitespot. There are several stages to this parasite's lifecycle and it must be noted that the parasite can only be killed during its free swimming stage. That is when the parasite is swimming around in the water looking for a new host. Stage 1: The white dots on the fish. The parasite has attached itself to a fish and is feeding off it. The parasite has a white case that is glued to the fish and is protecting the parasite from everything. Stage 2: The parasite has gorged itself on fish blood and drops off the fish and sinks to the substrate. When the parasite detaches from the host fish, it leaves a small wound and the fish's immune system patches up the wound leaving a small scab. The white spots disappear from the fish because the parasites are now on the bottom of the tank dividing/ reproducing inside their little white case. Stage 3: The white case with the parasites inside, ruptures open and releases hundreds of new parasites that swim around the aquarium looking for a new host to attach to. This is the only time you can kill this parasite, while it is swimming around looking for a new host. Once the parasite finds a new host and produces its little white case, you cannot kill it. If the parasite is not killed during this free swimming stage there will be a lot more white spots on the fish. Fish die from this parasite because they can't breath. The parasites affect any part of the fish they can attach to including the gills. When the parasites drop off the fish they leave a small wound that becomes a scab. One little scab is not an issue, but when the fish has 500 little scabs on their gills, it becomes very difficult for them to breath. The parasites damage the gills and cause scabs and scar tissue and the fish suffocate. Large numbers of parasites can also cover the gills preventing the fish from absorbing oxygen from the water. Treatment can range from Sulphur based medications (triple sulpha), Malachite Green based medications, Copper based medications, heat treatment, and moving the fish. Malachite Green based medications are the most commonly used and are available from any petshop. The parasite does not like heat and raising the temperature of the water to 30 degrees Celsius for 2 weeks will usually kill off the parasite. If the water temperature is below 24C then the temperature should be raised to 30C slowly, 2-3C each day until 30C is reached. *NB* If you are keeping coldwater fishes do not use heat treatment because the stress associated with the high temperature will probably kill the fish faster than the parasite. When using heat treatment you need to increase surface turbulence because warm water holds less oxygen than cool water. It is also a good idea to do a 75% water change and gravel clean the substrate, and clean the filter before treating the fish with any medications or heat. The water change and gravel clean will dilute the number of free swimming parasites in the water and cysts in the substrate, as well as removing most of the rotting organic matter that is in the gravel and filter. This allows medications to work more effectively and focus on the harmful pathogens rather than the bacteria feeding on the gunk in the gravel. If you don't want to use heat treatment or can't because you have coldwater fishes, and you are unable to get medication for a few days, you can limit the number of free swimming parasites in a tank just by doing big water changes and gravel cleaning the substrate. You do a 80-90% water change and complete gravel clean each day until you get medication. The big water changes dilute the number of pathogens in the water and that reduces the number of parasites that can infect the fish. *NB* Any new water being added to the aquarium must be free of chlorine/ chloramine before it is added to the tank. *NB* Big water changes and gravel cleaning alone will not cure the disease. It is simply to buy you some time until you can get some medication to kill off the parasites. This is something I do with marine fishes if they are in a coral tank or aquarium with invertebrates. Basically we move the fish into a clean container of water every day for a week. The parasites on the fish drop off after a few days at 26C, and sink to the bottom of the container. Each day you move the fish out of that container and into a clean container with new water. There are no free swimming parasites in the new container of water so the fish cannot be reinfected. And by moving the fish into a new container each day, you move them away from the parasites that have dropped off them. Eventually all the parasites have fallen off the fish and the fish are free of the disease. A heater (if required), thermometer and an airstone should be added to the container of water to help maximise oxygen levels and keep the water warm for the fish. The heater, thermometer, airstone and attached airline/s should be cleaned and disinfected before being used in another container. As should any nets used to transfer the fish from one container to another. Depending on water temperature in the main aquarium, you can usually put the fish back into their tank after 1 week. However, I prefer to keep them out for 2 weeks. The free swimming parasites cannot live more than 48 hours without a host fish. And it can take a week for all the cysts in the substrate to open. Keeping fish out of the tank for 2 weeks guarantees there will be no parasites left alive in it. Corals and shrimp are not affected by Ichthyophthirius. You only need 2 or 3 containers for this. Once the fish have been moved out of one container, you wash it out with hot soapy water and then give it a wipe down with bleach. Leave the bleach for 15 minutes and then wash the container out again to remove the bleach. Allow the container to dry completely and it is ready for use. If you use aquariums for this, only leave the bleach in the aquarium for 5 minutes because bleach damages the silicon glue that holds the glass together. I prefer to use plastic storage containers for this purpose because the plastic is unaffected by the bleach. There are new strains of this disease that have developed a resistance to most of the common medications that contain Malachite Green and Sulphur, and some parasites have developed a tolerance for high temperatures. In these cases you can use the moving technique. If none of the above treatments work, you can use Copper based medications. The parasite has not developed a resistance to copper and it will kill them. However, you CANNOT use copper in an aquarium with any invertebrates (shrimp, crabs, snails, corals, anemones, starfish, octopus, etc). Copper will kill these organisms as well as the parasites. In a previous post U/V steriliser was mentioned. This is done using an Ultra Violet (U/V) sterilising unit to expose the aquarium water to U/V light. The U/V light kills living things in the water. U/V units are like an external filter and are regularly attached to canister filters on the outlet pipe. They have a case containing an Ultra Violet light and a clear tube for water to pass through. Water is pumped through the clear tube and is exposed to U/V light as it passes through the unit. The slower the water passes through the unit, the more U/V light it is exposed to. The more U/V exposure, the more effective the unit is, and the more organisms that are killed off by the U/V light. Whilst these units do kill off the free swimming parasites, they do not cure the disease because there is no guarantee that every parasite will pass through the unit and be exposed to the U/V light. There are rumours that this parasite is found in all aquariums and all untreated water. That is false. The parasite has to be introduced into a water body, where it must find a suitable host within 48 hours or it will die. The only way for this disease to get into your home aquarium is through introduction of the disease. You have to bring this disease into your aquarium either on a new fish, new plant or other object from a contaminated tank, or in some water that has the free swimming parasites in it. In the OP's case, it was probably introduced with the new sand that was collected. The sand would have had some whitespot cysts in it that hatched out and have been killing the fish. When treating scaleless fishes (catfish, loaches, eels, Galaxias, Galaxiellas, etc) you should use medication at half strength unless the medication specifically states a dose rate for scaleless fishes. Wipe the inside of the glass down, do a 75% water change and complete gravel clean. And clean the filter before treating. Make sure any new water is free of chlorine/ chloramine before it is added to the tank. Last edited by Colin_T; 08-11-18 at 11:48 AM. I’ve tried both the heat treatment and Blue Planet Multi Cure (which contains both malachite green and methylene blue) but neither have proven effective against the whitespot. The relocation method seems interesting and I’ll see if it’ll work for the gobies. In the meantime, everything in the tank is gonna be sterilised with hot water, especially the sand. If the white spot persists, I’ll use copper-based treatments (after removing the shrimp to a separate tank). Won’t hurt to treat any new fishes with the copper medications too. Avoid copper. You will never get rid of the copper and will just cause other issues. I’ve tried malachite green and it didn’t work. I’ve used methylene blue in the past and it didn’t work either. Since copper is a no-no, what other medications could I use? Methylene Blue is used to treat bacterial and fungal infections but doesn't do anything to protozoan infections like whitespot, however Malachite Green should. Triple sulphur is an option but there have been reports of whitespot developing a resistance to it. After that the only thing left is copper or moving the fish to a different container each day for a couple of weeks. There are reports of whitespot being immune to common fish medications including Malachite green but I have never heard or had any whitespot that survived copper. Copper is relatively safe as long as you don't overdose it and after 2 weeks of treatment, do daily 75% water changes and gravel cleans for a couple of weeks to dilute it out. Then put some Activated carbon or Highly Activated carbon in the filter. Shrimp can go back in a few days after the carbon has been added to the filter. With heat treatment you need to get the temperature to 30C and keep it there for 2 weeks. Most people only keep the water warm for a few days and that doesn't kill all the parasites. The same deal with medications, you need to continue treatment for about 1 week after the last spots disappear from the fish. This is to make sure all the whitespot cysts in the gravel hatch and the free swimming parasites are killed. Some years ago Graeme and the guys at Perth Aquarium tried Praziquantel on whitespot and it apparently worked. You could give that a go and see if it does. Praziquantel also treats gill flukes and tapeworm so at the very least the fish will be free of tapeworms and gill flukes. Multi Cure contains both methylene blue and malachite green, thought the latter is in far lower concentrations than the former (0.4mg, compared to 4mg). With higher concentrations of malachite green, it may have been more effective against the whitespot. I'll see if the Relocation Method works, I'm already seeing fewer white spots on the gobies, afterwards the gobies will stay in quarantine until I sterilise both tanks with hot water and either malachite green or copper, plus the Heat Treatment. If the Relocation Method doesn't work, I'll use meds. I could use praziquantel for treating and sterilising newly collected fish for any potential parasites, and whitespot. I don't believe heat treatment kills whitespot but it will speed up the life cycle. Just because you are seeing less spots in no way indicates it is getting better. It just means they are dropping off and are into the next phase of their life cycle. Seeing less spots would mean that they've dropped off and are now vulnerable to being killed, right? Yeah nuke them whilst you can, if the fish have less spots on them, now is a really good time to make sure that you get them out of the water column. The spots drop off the fish and sit in the gravel for a couple of days. Inside the whitespot cysts, the protozoans are dividing and producing several hundred new parasites. In a couple of days the cysts will rupture open and release hundreds of new parasites. When that happens, the parasite can be killed. But while the parasites are inside the white cysts in the gravel or on the fish, they are immune to everything. Basically the parasites can only be killed when they are in their free swimming stage straight after they hatch out of the cysts in the gravel, and before they find a host fish to attach to. Having said this, if you are treating with medication, you continue treating for 1 week after all the spots have dropped off the fish. This gives the cysts time to develop and open and the new free swimming parasites can be killed by the medication in the water. Try moving them to a clean container with clean water each day for 2 weeks. As the parasites drop off the fish they sink to the bottom and when you move the fish into another container, they leave the parasites behind. Then drain and bleach the used container and let it dry for 24 hours before re-using it. If you have shrimp in the main tank with no fish, the white spot cysts will hatch and die because they can't find a host fish to live on. The parasites cannot burrow into the shell of a shrimp and simply die. If you don't have any shrimp or fish in the tank, raise the temperature to 32C and keep it there for a week. The high temperature will kill any and all protozoans in the water. Last edited by Colin_T; 09-11-18 at 09:23 PM.